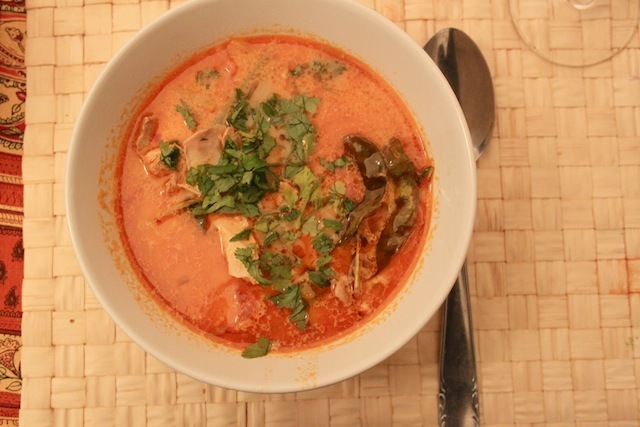 Thai on My Mind: Spicy Thai Coconut and Ginger Soup – Eat Me. Drink Me. I’ve been thinking about Thai food for weeks – ever since I had a bowl of relatively mediocre soup on my lunch break at work. For some reason, Thai soup has never really been on my radar. I’m more of a spicy green curry or peanut sauce girl. But even through the blasé of my work break soup, purchased from one of Berlin’s ubiquitous pan-Asian fast food chains, I could taste the intriguing combination of sweet and sour, creamy coconut and spice. It got me thinking. Or rather, it got me craving – and craving got me cooking. Even at the most worldly (read: expensive) grocery stores here, non-standard ingredients are hard to come by. There are no corn tortillas, for instance. And good luck getting your hands on a bag of brown sugar. (Also, there’s no corn syrup, which is not exotic and probably better for your body, but hey, when you’re trying to bake like an American, it can be a bummer.) So gathering the ingredients for this simple soup was a bit more time consuming than I’d imagined. I went to a Turkish shop for dried lemon leaves (forget fresh), spent a fortune on lime (one lime is a fortune here – oh, how I miss the ten-limes-for-a-dollar days in Brooklyn), and had to traipse into the high-end market for Thai chiles and lemongrass. It took three separate trips to the grocery store before they’d re-stocked the cilantro. I made the soup after a long day at work, which was both good and bad. Good, because I enjoy a multi-process cooking session to unwind after a long day, and bad, because it had been a long day, and I was hungry. It’s beautiful to build something cohesive out of so many different parts. With one hand, you’re making a chicken stock and tearing shreds of meat from the bone. 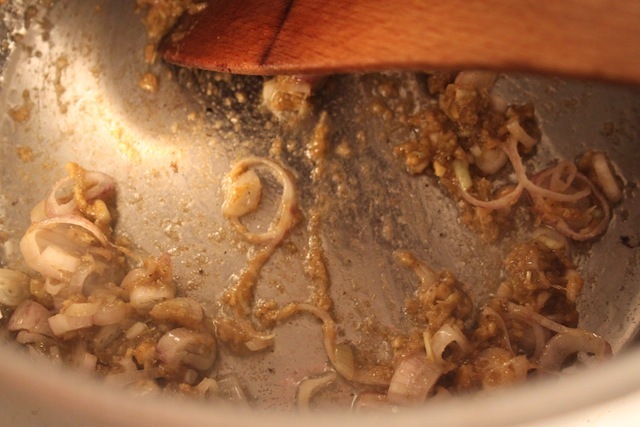 With the other, you’re grinding garlic, ginger and curry into a paste, then sweating it with shallots until your whole apartment smells like a Thai restaurant. Each step of the recipe seems disconnected from the next. How do canned whole tomatoes fit with Thai curry paste? Why would I squeeze lime juice into chicken broth? And yet, the soup that emerges at the end is a whole made of these disparate parts. My boyfriend ate five bowls, so I’m also going to go ahead and say it was delicious. Adapted from The Daily Soup Cookbook. Heat 2 tbsp of oil in a large pot over medium heat. Add chicken thighs and brown on all sides. Add water, bring to a boil, then reduce heat and allow to simmer for 10 minutes, until the chicken is cooked through. Remove the chicken with a slotted spoon and when cool, slip meat from bone. Set aside six cups of the cooking liquid for later (freeze the rest for another use). Puree the garlic, ginger, lemongrass, sugar, curry paste and salt in a blender until creamy. Finely slice your shallots. Heat the other 2 tbsp oil in a large pot over medium heat and sweat the garlic-ginger puree and shallots for 4 minutes, until tender and fragrant. Add the tomatoes and simmer for 5 minutes, breaking up any large chunks of tomato in the pot. Add the reserved chicken broth, potatoes, lime leaves, chile and the juice of 1 lime. Bring the mixture to a boil, then reduce heat, partially cover and simmer for 20 minutes. 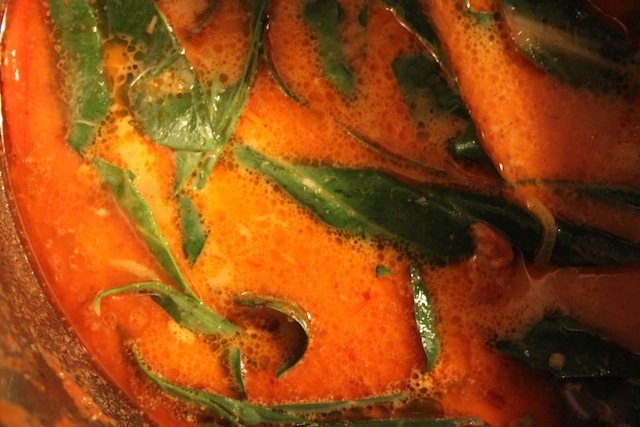 Add coconut milk, hot sauce, and chard and simmer for another 2 minutes, until the chard has softened. Serve with a blend of chopped scallions and cilantro. I will make this this weekend!